This is the twenty fifth post of our series of projects to make us thankful for DIY. Be sure to check back everyday during the month of November for new simple and easy DIY projects. Shane Conlan over at DIY for Knuckleheads likes working through his pile of scrap wood and doesn't miss a beat to have a chance to put something in his pile to good use. Plus, he has so much fun doing so. Watching him put together his scrap wood Christmas tree brought to mind something that I've been pondering lately. So often we head to the attic and lift out the artificial tree and begin to decorate it with several boxes of ornaments that we also had to haul out. There's manual labor and effort to get this stuff out of storage. Or, if you're the "real tree" type of family, there's the effort expended to go purchase one, somehow transport it home, and then wrangle it into the Christmas tree stand. Did I also mention that you're running around with the vacuum cleaner almost daily trying to stay on top of the needles? That wears me out just thinking about it. 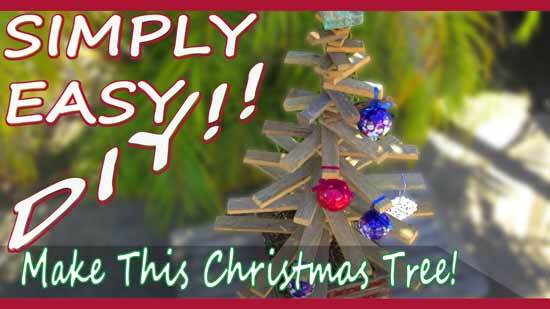 Consider creating and giving away this lightweight table top version of a Christmas tree. I'm envisioning a small strand of white lights and some home made pinecone ornaments made by the kids or grandkids and this tree is good to go. I hope you enjoyed today's featured project and don't forget to stop by "DIY For Knuckleheads" YouTube channel to check out even more great woodworking videos from Shane. Don't forget to subscribe.